Each node corresponds to an operation on one or several terrains. The color of the node outline corresponds to the type of operation. The nodes are connected together by links (see Connectors and links for more details). Return to any node at any time, modify a parameter and immediately see the effect on the end result. Right-click in the Graph editor and select Create node and a node category. To select a node, simply click on it in the Graph editor. 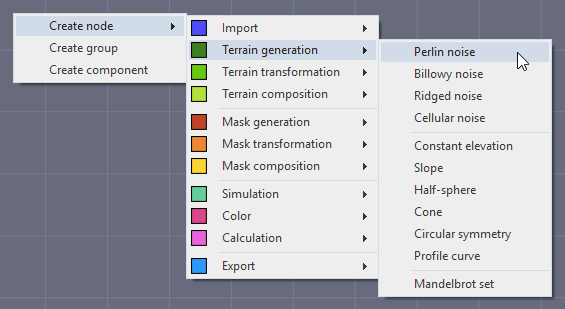 When a node is selected, if its computation is associated with a terrain or a mask, the terrain or mask is displayed in the 3D View. 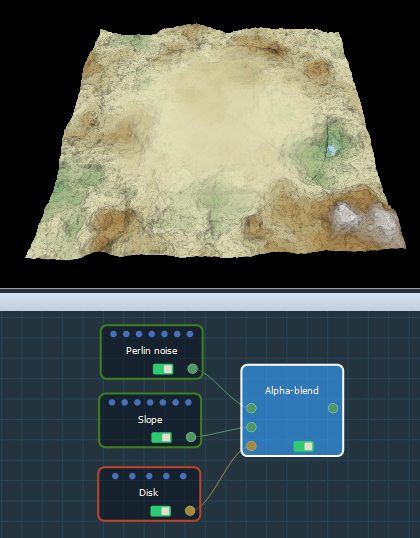 In the example below, clicking on the Alpha blend node shows the computation of the Perlin noise and Slope terrain generators. Default mode: Press Shift and drag the mouse over the nodes to select them. Maya mode: Press and drag the mouse over the nodes to select them. 3ds Max mode: Press and drag the mouse over the nodes to select them. To add a node(s) to the selected nodes, press Ctrl and click the node to add. To delete a node(s) from the selected nodes, press Ctrl and click the node to delete. To move a node(s), click on it, hold down the left mouse button, move the mouse, and then release the button. When multiple nodes are selected, moving one node moves all selected nodes. All selected nodes retain their relative position. To copy a selected node or nodes, select Edit > Copy or press Ctrl+C. To paste a selected node or nodes, select Edit > Paste or press Ctrl+V. When linked nodes are copied and pasted, the new nodes are linked in the same way. When running two Instant Terra windows at the same time, you cannot copy nodes from one Instant Terra window to the other. To edit a node, double-click on it in the Graph editor to open its parameters. 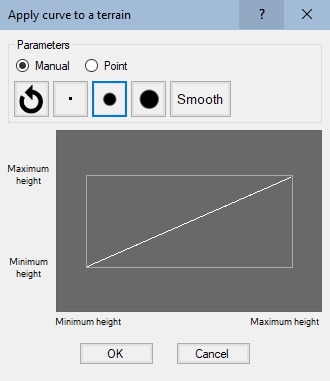 The example below shows the parameters for the Apply curve node. For some nodes, double-clicking on this node produces no effect because they do not have any editable parameters. To delete a selected node or nodes, select Edit > Delete or press the Del key.